Spring is a beautiful season. As we emerge from the cold and the darkness of winter new life ‘springs’ up around us! From crocus and daffodils to the baby robins in the tree outside my front door, I always look forward to the signs of spring. Unfortunately, it always seems to take longer to get here than I think it should, which is why now is the perfect time to focus on spring crocheting. 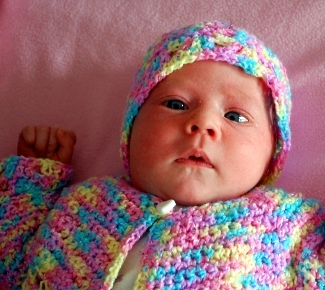 Take your pick from the projects in this issue of Crochetvolution! There’s more than one way to warm your shoulders, and a little friend for the kids, plus something for heads and even a cute little bag. Don’t forget! If you like this issue of Crochetvolution you can subscribe today to be notified when when new content is available. It’s free, it’s easy, and it’s delivered right to your inbox! If you prefer, you can also follow Crochetvolution on Facebook. Would you like to participate in Crochetvolution? Send in your submissions! Crochetvolution is by crocheters, for crocheters, and whether you’re a designer, a writer, a crocheter who’s proud of your work, or you are a designer selling your patterns independently, we want you! We pay for patterns and articles, so send in your submissions today! Enjoy the issue, and thank you for reading!